DRAINFIELD // LATERAL FIELD What to do and not to do! Home » Uncategorized » DRAINFIELD // LATERAL FIELD What to do and not to do! 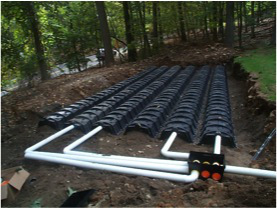 Today I will elaborate on the septic system drainfield and the best way to care for it. 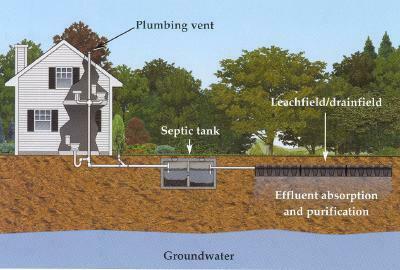 In the diagram above, you can see all the components of a septic system. There is a tank and a leachfield/drainfield. When I talk to customers, many of them are confused as to what makes up a septic system. I would say many think that all they have is a tank and that is it. However, the bigger portion of the septic system (and also the most expensive part) is the leachfield/drainfield/lateral field. This part of the septic system is where the final treatment takes place. It is also very important to know where your lateral field is located. If this portion of your system becomes damaged or inhibited in any way, it will ruin the functionality of your septic system. Below is an example of a lateral field being installed. You’ll notice the black plastic chambers situated in rows. Looking at the picture above, understand that eventually all these components will be covered with dirt and over time, should have nothing but grass growing on top. Though the black plastic chambers are hard and strong enough to the support the weight of your average man, it is not strong enough to withstand the weight of a car, truck or large vehicle. Those vehicles could crush this even under the ground. The whole point of a lateral field is to “create air space” underground for water to collect. If this area gets crushed, then the water that is collecting there, will start leaking to the surface. Not good. I love this picture to show how a lateral field is laid out and installed, but what I do not like are all the trees surrounding it. One, you really don’t want to plant anything more than grass on top of your lateral field, but you also want to keep it away from trees too. The state guidelines suggest a minimum of 25 feet from trees as their root systems can extend extremely far. Roots can clog and ruin a lateral field too. Believe it or not, people forget where their lateral is and then will sometimes build over it. Again, this area needs to be kept open so it can breathe and evaporate water! Nothing stops evaporation quite like a solid building! Do not lay sprinkler lines on top of your lateral field. (Also, beware of runoff water). If this area is supposed to absorb water and act like a sponge for both your home and from Mother Nature, do not “feed” it more water from a sprinkler system. If you constantly keep it wet, there will be nowhere for your water to go. This can lead to gross standing water on top of the laterals or back-ups into your home. Also, beware of how the guttering off your house drains. Make sure it bypasses this area so it can stay as dry as possible as often as possible. That’s the basics of lateral care. Again, it’s not rocket science, but it is something to always be mindful of when caring for your system. If you want more tips about what to plant, check out our TIPS button on the main menu of this website. I have a designated area that discusses safe vegetation.